Matthew Boyd has been around for a bit. He was drafted by the Blue Jays in the sixth round of the 2013 Draft out of Oregon State University. He made the majors with the team but was traded to the Tigers at the 2015 trade deadline along with Daniel Norris and Jairo Labourt in exchange for David Price. As a prospect, he wasn’t too highly regarded. While he was a regular on Carson Cistulli’s Fringe Five column, he wasn’t highly ranked. Baseball America, for instance, included him in their organizational rankings only once (he was the 29th prospect in the Jays system after the 2014 season); he received sporadic mention at Baseball Prospectus. After splitting time between the majors and Triple-A in 2016 and 2017, 2018 showed some promise for Boyd. His strikeout rate went up and his walk rate went down. His home run rate also went up and while overall he took a step forward as a decent rotation guy for the Tigers, there was room to improve. 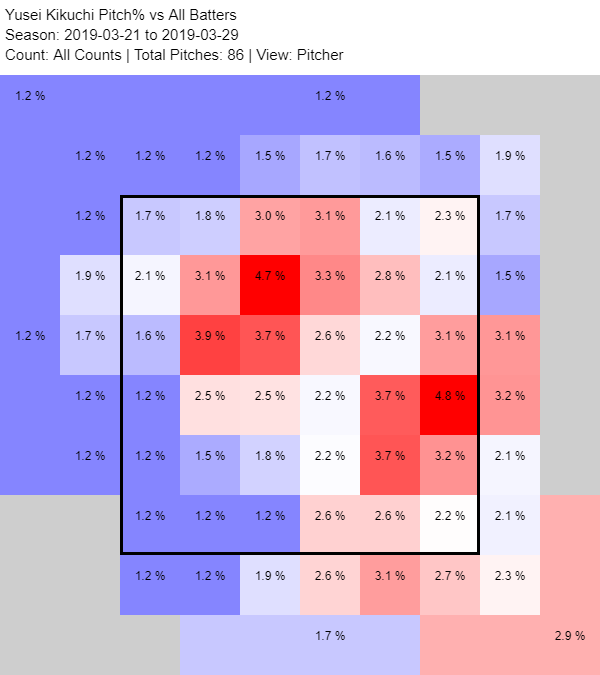 As my friend Brandon Day over at Bless You Boys noted, Boyd showed an extreme home/road split, which is one pitfall of being a flyball pitcher whose tendencies can be masked by playing in the pitcher-friendly Comerica Park. Boyd himself wasn’t satisfied either. He spent his offseason basically finding every way he could to improve himself. He lost 15 pounds, maintained his muscle mass, and even did DNA-based testing to find out what works and doesn’t work for his body. If you’re talented enough to make it to the majors, you often have had to make a series of adjustments to maximize your potential and survive in the league. If you are really talented, knowing yourself and being open to changes can really put your name on the map. Yandy Diaz is really talented. We’ve raved about his tools and uber-muscular physique. The Rays are giving him a starting opportunity pretty much every day, which is exciting; they have to be excited by the return as well. So far in 2019 (all statistics are as of April 9), Diaz has turned in a .308/.386/.615 line with a 183 wRC+ and three home runs. The Rays have gotten what they have hoped to get from him in the first 10 games. Diaz’s underlying numbers — not only this year, but also from the years prior — testify to his strength. In 2017 and 2018 with Cleveland, Diaz hit for average exit velocities of 91.5 and 92.1 mph, respectively, which was well above the league average of 87.4 mph. He also was an extreme ground-ball hitter. In 2018, his launch angle was 4.4 degrees, much lower than the league average of 10.9. As a result, 53.3% of his batted balls last year were grounders, which, if he had had a qualified number of at-bats, would have ranked in the top 10 in the entire league. Because Diaz has such a low launch angle, all he has to do is swing up, elevate, and celebrate, right? It’s not exactly that simple. In midst of baseball’s fly-ball revolution, we have seen instances of players actually trying to swing more “level.” Last year, Jeff Sullivan noted Joc Pederson and Kyle Schwarber’s adjustments. Kris Bryant also saw strides in his production after adjusting his swing to spend more time in the zone. We have many other success stories in which hitters benefited from, well, learning to lift the ball. The point is that the equation isn’t so simple. If it were, every hitter would be enjoying success by altering their swings in the same way. It is a league-wide trend, for sure, but there are things that work for some and don’t for others. Diaz is a special case though. Because he is such an extreme groundball hitter who can also hit the ball hard, it could be worth it for him to experiment with different approaches to become his best self in the majors. It might not work out, of course. But because of his above-average exit velocity, it could pay off quite handsomely. Look at his home run versus Gerrit Cole from earlier this season. He is as true a submarine pitcher as one could be, which is quite rare in the current baseball landscape. Not only is he fun to watch, but he is also one of the top Korean-born pitchers in the Korean Baseball Organization (KBO). In 2018, he had his finest season yet, going 14-8, with a 4.18 ERA (125.8 ERA+) in 30 starts, striking out 133 in 159.1 IP. He also made the Korean national team for the 2018 Jakarta Asian Games and played a part in the Wyverns’ 2018 Korean Series championship. All in all, it was a big year. However, it seems that he has set his sights on an even bigger future. 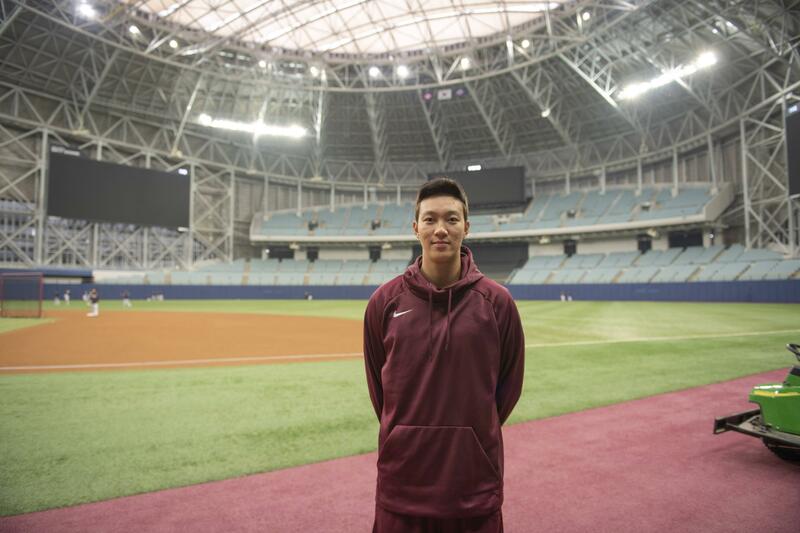 This week, I sat down with Jong-Hoon at the Munhak Baseball Stadium, the Incheon home of the SK Wyverns, to talk about his development, his delivery, his pitches, and his desire to go to the major leagues. Originally, I intended to focus on his development as a submariner, but once he mentioned his big league ambitions, our conversation changed a bit. No one really starts out as a submarine pitcher. Neither did Park. 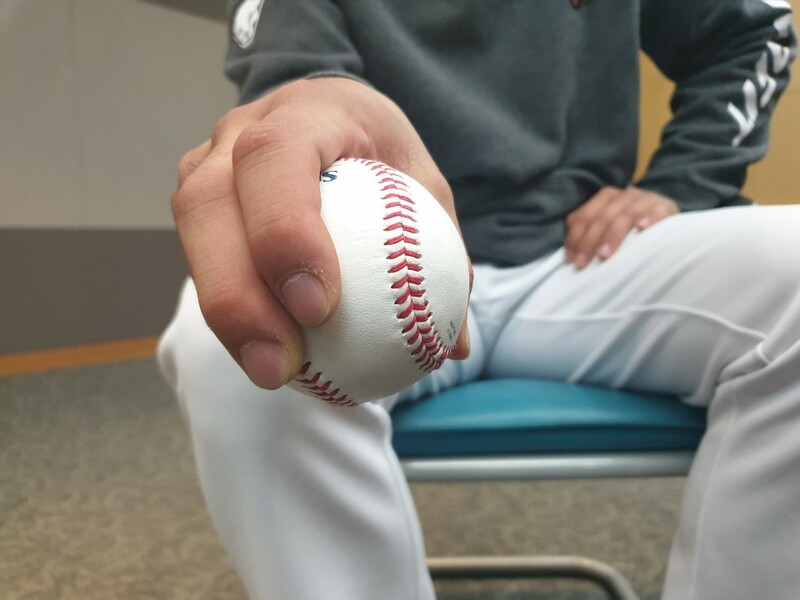 When he was attending Gunsan Middle, his school’s baseball team needed a sidearm pitcher. The team’s manager asked his players to find the most flexible student they knew who was willing to throw a baseball. They recommended Park to him. “The team only had pitchers who threw with overhand or three-quarter slots,” Park said. Park’s rawness showed immediately. From 2011 to 2012, he appeared in just 15 games and gave up 17 walks, four hit by pitches, and 18 runs in 24.2 IP. After the 2012 season, Park opted to serve his mandatory military service and was admitted to play for the army baseball team. He returned to the Wyverns in September 2014 and started to see more action in 2015. That season, by the way, happened to be current Diamondbacks right-handed pitcher Merrill Kelly’s first year with the Wyverns. Kelly pitched for the Wyverns from 2015 to 2018, and earned a two-year major league contract with Arizona this past offseason. Park is appreciative of the four seasons he spent as Kelly’s teammate. “I’m thankful for Kelly,” Park said, “he’s the reason why I came to appreciate and learn baseball deeper.” Through Kelly, Park learned new throwing routines, weightlifting methods, and mental approaches to hitters. He was also introduced to American baseball coaching books, which he read and studied by translating. His strikeout and walk numbers have noticeably improved. One could say that he traded some of his groundball tendencies for being able to throw strikes. Even so, Park has managed to keep the batted balls in the yard- his 0.90 HR/9 IP rate is the ninth best among all KBO starting pitchers last year, which is no easy feat in the league and especially at the Munhak Baseball Stadium. Munhak is known to be an extreme hitter’s ballpark with 311.7/393.7/ 311.7 foot outfield dimensions, meaning the left and right field fences are closer to home plate than the Yankee Stadium short porch. It will be interesting to see how his numbers trend in the 2019 season, but the recent history is promising. Park also says that he makes it move differently for different-handed hitters. “I have better stats against left-handed hitters than right-handed hitters,” he notes, and he’s not really wrong. In 2018, he allowed a .714 OPS against lefties as opposed to .723 OPS against righties. From 2015 to 2019, he’s allowed .724 OPS against LHH and .775 OPS against RHH. And here’s a three-pitch strikeout in which he used the curveball in similar locations to get a called strike, a weak foulball, and a swinging strike. In 2018, he used the curveball 42.6% of the time, which is a significant amount. The pitch averaged at 119.1 kmph (74.0 mph). Park also has a fastball (41.1% usage), which averaged 131.6 kmph (81.8 mph), a two-seam fastball (12.2%) that averaged 128.5 kmph (79.9 mph) and a changeup that he used very sparingly (3.7%) that averaged 123.8 kmph (76.9 mph). According to a person familiar to the situation, several major league scouts have periodically come to Munhak Baseball Stadium to watch his starts. If the Wyverns were to post him as soon as he is eligible, the timing could be tricky. Depends on how long he is on the active roster and avoids injuries, he would be eligible as soon as after the 2020 season. If he is not as lucky with how his service time stacks up, it would be after 2021. Because Park will turn 30 in August 2021, one would assume that he wants to head stateside as soon as possible. At this moment, it is a bit early to speculate on his major league chances. What helps Park is that he may not have completed developing due to his unusual amateur background, which could project well by the time he’s eligible to be posted. He also has brings the benefit of giving a very, very different look to hitters, not to mention that his approach has worked well in the offense-friendly environment of the KBO. There are, of course, many question marks. Heck, there are question marks for players who are deemed to be top-notch major league prospects. His command is still work in progress, we don’t know how well his stuff would translate in the majors, and we don’t know yet how interested the teams are. Park wanted to be different, he learned to use his uniqueness in the KBO, and he became one of the best Korean-born starting pitchers in the league. That in itself is pretty significant. *All KBO stats from Statiz unless specified. It’s been a whirlwind few weeks for Yusei Kikuchi. Not only did he see his first action as a major leaguer, a well-documented dream of his since his high school days, but his father passed away after a long battle against cancer. He is staying in the United States in accordance with his father’s wish that he concentrate on baseball. It is quite hard to imagine what the young pitcher must be feeling, and we wish for the best for him and his family in this difficult time. Kikuchi has made two starts for the Mariners. While some data exists from his days in the NPB, MLB presents a new challenge. We can’t reach any grand conclusions about him as a major leaguer yet, but we can make observations and possibly, some extrapolations. At this moment, here are the basic numbers: 10.2 innings pitched, five hits, three earned runs, two home runs, eight strikeouts, and one walk. Kikuchi currently has a 2.53 ERA and a 4.25 FIP. It’s too early to make any calls, but Seattle has got to be pleased with the return so far. Our analysis of this limited sample becomes trickier because we only have Statcast data for one of his starts. His Tokyo start – you know, the one where Ichiro announced his retirement mid-game – is not registered there because the Tokyo Dome isn’t equipped with Trackman or PITCHf/x cameras. So, we have his 91-pitch start against the Red Sox on March 29, which is quite a small sample to work with. Kikuchi’s tendencies could change as he pitches in the majors and adjusts to either his strengths or hitters’ weaknesses (or both). With those the caveats understood, his early efforts still merit examination. Let’s start with the obvious here: the fastball. Since he was an acclaimed prospect at the Hanamaki Higashi High, Kikuchi has been known in Japan for his fastball velocity. In 2017, he set what was then an NPB record for the fastest pitch recorded by a left-handed pitcher with a 158 kmph (roughly 98 mph), though it should be noted that his average fastball velocity was 148.6 kmph (around 92.3 mph). In 2018, his velocity slipped a bit. According to Delta, an NPB sabermetrics site, it went down to 147.3 kmph (around 91.5 mph) last year. He suffered shoulder tightness that was later diagnosed as decreased functionality of shoulder last year, so that seems to have played a part in the decline in velocity. Of all his pitches, the fastball is the only one that Eric Longenhagen and Kiley McDaniel did not describe as above average in their write up of Kikuchi for in this year’s top 100. By average velocity, he’s comparable to the likes of David Price and Sean Newcomb. Maybe he’ll gain a tick or two as the season goes on or maybe he’ll get worn down. I don’t know. But as far as the velocity goes, Kikuchi can say he belongs in the majors. One thing of note is that his fastball only induced a whiff once out of the 43 times he threw the pitch. Statcast measured the pitch’s average spin rate at 2,173 rpm. According to Travis Sawchik, an average fastball around 93-94 mph measures out to 2,240 to 2,300 rpm. At least for that one start, his fastball was not seen to be a swing-and-miss weapon, as his velocity would indicate. Obviously, Kikuchi has arm strength, but not all 93 mph fastballs are created equally. Luckily for him, he has another tool in his toolbox that drew many more swings-and-misses: his slider. Kikuchi’s slider features a nasty 10-5 tilt. He used it as a swing-and-miss pitch in Japan, and he’s used it as one in his early going in the majors as well. Against Boston, he generated seven whiffs from 22 sliders used, which is pretty good! Here’s one to Xander Bogaerts that I feel is representative of how he likes to use the pitch. And here’s one to Sam Travis that had a particularly vicious bite. Looking at Kikuchi’s slider heatmap from that game, we see a lot of low and inside pitches to the right-handed heavy Sox lineup. Being aware of his pitch tendencies from the NPB, I’d assume he meant to locate them that way as well. It’s hard to draw a conclusion at this moment, but Kikuchi’s slider has been rated above-average, as noted by Eric and Kiley. Future value grades don’t always come to fruition, but I would say that Kikuchi’s slider could forecast well in the majors. The good here is that Kikuchi located well to the inside edge versus right-handed hitters, and away versus left-handed hitters. However, there’s that big dark and red circle towards the middle-up part of the strike zone that indicates that he was also prone to leaving pitches “up there.” FanGraphs rated his command as a 45-grade, which is just below major league average. As of this moment, Kikuchi has thrown 64% of his pitches for strikes and allowed only one walk in 10.2 innings pitched. Those are good control numbers. Command is a different thing. The Red Sox hitters were much less than forgiving on Kikuchi’s mistake pitches. Here’s J.D. Martinez going yard on a fastball right down the middle. The catcher had his glove up and in, but the ball missed the spot and Martinez drove it over the center field fence. Here’s another home run allowed, this time against Xander Bogaerts. The explanation is simple – the catcher appears to have wanted it down and away but the fastball went right down the middle, which is likely to be punished by many major league hitters. Pitching is extremely hard. You must stand a mark and locate each pitch into a glove size smaller than a pie tin from 60 feet 6 inches away. But it’s also the nature of the business – if you miss even so slightly, major league-caliber hitters can hit it a long way. It is worth noting that every pitcher makes mistakes. It’s the matter of minimizing the amount of them. There will be days when Kikuchi will makes fewer mistakes, and there will probably be days he makes more. What’s curious for now is that Kikuchi has noticeably bumped up his curveball usage. Here’s the chart of his March 29 start versus his 2018 pitch data with the Seibu Lions, thanks to the NPB sabermetric website Delta. It’s an interesting bump. He never threw his curve more than 11.1% in a season with the Seibu Lions. He was known for his fastball/slider mix in Japan. The curveball, according to multiple scouting reports, was a third pitch that he would use to give different looks. And it’s not just his start against the Red Sox either. Over at Lookout Landing, Jake Mailhot recorded Kikuchi’s pitch data by hand during the Athletics game in the Tokyo Dome. The chart below indicates that Kikuchi has shown very similar pitch mix for his first two starts as a big leaguer. Not only does an effective curveball give hitters another thing to worry about, but the velocity difference can also make his heater stand out more. Here’s a curveball that he threw to the reigning AL MVP Mookie Betts. Betts reacted like he was not expecting this pitch. He held up a for a microsecond and got his bat head out, but made weak contact that ended up being a groundout. He didn’t generate any whiff with the pitch, but it induced two bits of weak contact for an overall .124 xBA. He also used it to get ahead in counts. Out of 18 curves thrown, nine of them were called strikes. Here’s one of them to Betts. Kikuchi has had two decent starts and the pitch has worked well, so I don’t anticipate him making drastic changes anytime soon. It will be something to monitor, though. History has shown that many successful pitchers – Tanaka, for instance – have demonstrated the ability to modify their approach to survive in the majors. As time goes on, major league teams will have a book on how to approach Kikuchi. Once they know better what to expect, I don’t know how successful they’ll hit against him, but surviving in the majors involves series of adjustments. If Kikuchi runs into a harder time getting hitters out, I would expect him to take a different approach. Lastly, it’s worth noting that Kikuchi seemed to struggle when facing the order the third time around. In a very small sample, Kikuchi faced five batters a third time through the order between the A’s and Red Sox games, and allowed two hits, including that aforementioned JD Martinez home run. Again, it is hard to draw conclusions out of five-batter sample, but the concern is not unfounded. The lack of a big fastball could become a problem late in games in instances where he struggles to give hitters different looks. As Bill Petti has written for FanGraphs about how pitchers with a big fastball — who can maintain that velocity late in games — are more likely to pitch deeper. There will be so much more Kikuchi to watch. Personally, I’ve waited for awhile for him to arrive to the majors, as I’ve written about the lefty a couple of times in the past. Two starts in, Kikuchi gave his team a real chance to win on both occasions. For a starting pitcher, there’s not a lot more you can ask for. Earlier this spring training, everyone cringed a bit when it was reported that Brandon Nimmo became sick after eating under-cooked chicken (his own recipe, naturally). I think most people had the same thought about it: what the heck? It turns out that his illness was a result of a virus instead of food poisoning, so now Nimmo is free to eat as many under-cooked chickens as he wants, but the (subjective) fact remains that it is quite gross. Anyway, this isn’t about Nimmo’s illness or his ill-advised recipe. This is about baseball. Nimmo had one of the biggest breakouts of 2018. Because the Mets were not great last year, I don’t think a lot of people appreciated how well he performed. Nimmo put up a 4.5 WAR, which was 29th-highest among all positional players, coming in his age-25 season. Among all 25-year-old position-player seasons from 2010 to 2018, Nimmo’s campaign ranks 24th. There are some nice names on the list as well — Christian Yelich, Trea Turner, and Nolan Arenado, for instance. FanGraphs’ own Eric Longenhagen told me that there’s an untapped potential in Nimmo that could be uncovered as he plays more. “There’s always a chance that he grows and changes into a different player as he ages, and that might be especially true here because his amateur background is so bizarre compared to most pro baseball players.” Nimmo is from Wyoming and did not get to play regular high school baseball. He had to drive anywhere between 45 minutes to 10 hours to play American Legion ball to get exposure. Nimmo has a cool story that could get cooler as he gets more playing time in the majors. This invites the question that applies to every young player: who can Nimmo be? Is there a particular role model? ZiPS expects him to hit .240/.359/.402 (116 wRC+) with a 2.3 WAR, with his No. 1 comparison being Andy Van Slyke. That feels conservative, but that’s the nature of projection systems — Nimmo doesn’t have a long history of being an excellent major league player, and he did put up 89 and 118 wRC+ marks in the previous two seasons. I became curious and decided to search for someone whose numbers resembled Nimmo’s walk and power tendencies from the 2018 season. Why those two? For one, Nimmo boasted a high walk rate of 15%, which engineered a .404 OBP. The only players who were ahead of him in on-base percentage last year were Mike Trout, Mookie Betts, and Joey Votto. Nimmo was ahead of known superstars such as Bryce Harper, Alex Bregman, and Yelich, which is significant, especially for a youngster playing in his first full major league season. Nimmo also put up a .219 isolated power mark, which is above average and contributed to his 4.5 WAR. It’s not a top-notch number yet, but because of Nimmo’s youth, one might expect it to rise in coming years. I looked up seasons from 2000 to 2018 to find players whose walk and power numbers profiled similarly to Nimmo’s, and one name in particular stood out. The walk and power numbers aren’t the only similarities. Their batted ball profiles also share a resemblance. We actually don’t have the mystery player’s ages 23-to-25 data for that, so we’ll use his career numbers from 2002 to 2014. Physical description: Athletic actions, frame has chance to carry more strength. Strong points: Outstanding approach to hitting, sweet short compact stroke w/outstanding balance, knowledge of K-zone, good 2-strike hitter, spray ball to all fields. Gap to gap guy, run well especially 1st to 3rd, arm avg to above w/ good carry and rot (rotation? ), 4.16 speed to 1B, can play LF-RF fairly well occasionally gets good jumps. Summation: Young good looking hitter. Mark Grace type and when strength comes he should be able to linedrive some HRs. Defense skills are a little short and experience will help improvement. 3 tool guy now with a high ceiling. On-base ability always has been the bedrock of Nimmo’s game, for he excels at working counts and lining the ball to left field if pitchers work him away. He shows pull-side power in batting practice but prefers to work the entire field in games with a handsy, lefthanded swing geared more for line drives than home runs. Nimmo tracks the ball well in center field and grades as at least an average defender with ordinary running speed. He’s graceful and reliable in the outfield, though his average arm would be stretched in right field, if he has to move. Nimmo hasn’t attempted many stolen bases as a pro, and that probably won’t change. The scouts’ eyes saw similarities as well. They both point out line-drive power that could develop into more home runs in the future (which it did for the mystery player). The scout from 1995 noted the mystery player’s “outstanding approach to hitting” and “good knowledge of K-zone” while the BA praised Nimmo for his plate discipline. If you haven’t identified the mystery player yet, the answer is Bobby Abreu. The thing is, there are also quite a lot of differences between these two. As you saw from the first table, Nimmo struck out way more than Abreu did. In 2018, Nimmo’s strikeout rate was 26.2%, which is much higher than Abreu’s career average (18.3%), and his career high in a full season (22.6%). Nimmo could improve there, of course. Young hitters tend to lower their strikeout rate until their peak age. According to research from Jeff Zimmerman, Nimmo is at the age where his strikeout rate might be as low as it will get, but we can give him the benefit of the doubt due to his weird amateur background and relative newness to the majors. When I looked up Nimmo’s walk rate and strikeout rate compared to hitters’ seasons from 2000 to 2018, he profiled closer to Adam Dunn and Jim Thome — two sluggers that had way more power than Nimmo is projected to have. Due to Nimmo’s scouting profile, particularly his walk and power tendencies, I felt Abreu would be a better fit. It is worth noting that hitters strike out much more now than they did during Abreu’s time. One can assume that Abreu would have struck out more if he were to play today than in the early 2000s. As for Nimmo, there have been instances where players drastically improve their strikeout rate, but it’s not really something to count on. You can expect improvements, but as far as the pure numbers go, Nimmo is likely to stay a bigger strikeout hitter than Abreu was. I mentioned the batted ball profile before. There’s also a stark difference between those two on that score. Something that jumps out here is the infield fly ball rate. Also, Nimmo seems to have a more pull-happy approach, which became more apparent in 2018, when he pulled 44.7% of his batted balls. Travis Sawchik examined this back in June, noting that his new pull approach may have helped his overall power numbers. Perhaps it’s not something Nimmo would like to give up for now — it did help his power breakout last year, after all. Writing this, I was originally thinking along the lines of “how Nimmo can become Abreu,” because becoming a two-time All-Star who enjoyed a fruitful 18-year career is a heck of a thing. But after realizing that a major difference between those two — Nimmo’s pull tendency — actually helped the youngster’s ascendance to being an exciting major league regular, I’m not so sure anymore. Would he change his swing for a different approach? Longenhagen doubts it. “I think that kind of thing is harder to change. I’d expect him to be pull-heavy for the duration of his career,” he said. There are numbers that indicate that he could be the newer-age Abreu while not completely being an Abreu. I’m not guaranteeing that Nimmo will end up a player who will get Hall of Fame consideration, but there are stats that indicate similarities with a player who will certainly be on next year’s HOF ballot. Some things are nice to dream on. In the past few years, we’ve seen instances of hitters improving their production and changing their fortunes by learning new swing mechanics that were once deemed unconventional but that are now fueling change. If you have followed this trend, you may have heard of Doug Latta, a hitting instructor who works out of his facility, “The Ballyard,” in the Los Angeles area. FanGraphs has written about Latta’s work in the past (as have many other publications), and how he defines efficient swing movements (setup, balanced move to the pitch, longer swing path in the zone) and their desired results (increased exit velocity, better launch angle). Latta’s name first surfaced on the professional baseball mainstream’s radar back in 2013. Beginning in July of the 2012 season, Latta worked with outfielder Marlon Byrd on revamping his swing while Byrd was serving a 50-game suspension for testing positive for Tamoxifen. Byrd was coming off a season in which he had posted a paltry 26 wRC+ in 48 games with the Chicago Cubs and Boston Red Sox. After working with Latta, he burst back onto the scene with a .291/.336/.511 line, 25 home runs, and a 137 wRC+ in 147 games in 2013. (His performance after declined, and following another PED suspension for 162 games in June of 2016, Byrd retired.) Not long after Byrd’s swing started to see success, Latta helped engineered another notable career breakout in Justin Turner. This part of the story is well-documented. Turner, originally a 2006 seventh-round pick by the Reds out of Cal State Fullerton, made it to the major leagues with the Baltimore Orioles in 2009. But after a .111/.226/.111 slash line in 17 games for Baltimore, he was designated for assignment in 2010. He was then claimed off of waivers by the Mets. He would spend the next three seasons in Queens, hitting .265/.326/.370 with only eight home runs in 301 games. Following the 2013 season, he was non-tendered by the Mets, making him a free agent. During that offseason, Byrd, who was teammates with Turner in 2013, shared how the swing overhaul from Latta was doing wonders for his career. The pair worked together at the Ballyard that winter, and the result showed right away. In February 2014, Turner signed a minor league deal with the Los Angeles Dodgers and earned a spot for the Opening Day roster by hitting .389/.477/.528 in 19 Cactus League games. He proved the performance was no fluke, hitting .340/.404/.493 with 7 home runs (158 wRC+) in 107 games. And Turner has continued to hit. As a Dodger, he has posted a .305/.383/.505 line with 85 home runs in 619 contests. He also earned a four-year, $64-million contract after the 2016 season and was named an All-Star in 2017, a stark and positive contrast to his position just a few years prior. Back in 2011, the Yankees had a lot of fun after signing two aging starters to minor league contracts, when they brought on Bartolo Colon and Freddy Garcia. Colon was deemed to be done by many. He went so far as to get a stem cell injection in his shoulder to give it another go. Garcia had a so-so season in 2010 and was working with significantly diminished stuff from his prime, but the two combined for 4.8 WAR, helping the Yankees on the way to a division title. Eight years later, New York has signed Gio Gonzalez to a minor league deal. He will earn $3 million if he reaches the big leagues, with incentives based on games started. He has the ability to opt-out on April 20 should he not receive a major league assignment. The circumstances that led to signing Gonzalez now, and Colon and Garcia then, are different, but the best-case scenario might be the same: big bang for the buck from a veteran arm. Normally, there are five starting pitchers in a set rotation; two of the Yankees’ are injured this spring. Luis Severino, the staff ace, has an inflamed rotator cuff and is expected to be out until May. CC Sabathia is recovering from angioplasty and right knee surgery, and is projected to return sometime in April. That leaves two spots open beyond the cast of James Paxton, Masahiro Tanaka, and J.A. Happ. Some would say that Ahn Woo-Jin of the Kiwoom Heroes is the most high-profile pitching prospect in all of the Korea Baseball Organization (KBO). He has been a highly-touted arm since pitching for the Whimoon High School in the Daechi-dong area of Seoul, topping out at 156 kmph (around 97 mph) and showing solid feel for his secondary pitches. He also has the look of a hurler. He’s got the height (around 6-foot-3), a frame that could fill out as he grows, and long limbs. Ahn was drafted by the Heroes in the first round of the 2017 KBO Draft, and signed with a franchise-record six billion won (around $530,000) bonus. The 19-year-old rookie’s 2018 regular season numbers weren’t pretty. He went 2-4, 7.19 ERA (5.74 FIP) with 46 strikeouts, 28 walks, and six home runs allowed in 41.1 IP. Besides the strikeouts, the numbers indicated a clear rawness from a kid who was the age equivalent of a college freshman. However, after a series of adjustments, he became a formidable force out of the pen in the 2018 postseason. In 15.2 IP, Ahn struck out 18 and walked only one, while allowing just two earned runs and a home run. A 15.2 IP sample size isn’t as big as 41.1 IP, but it seemed clear that the tweaks made a difference. This is Sung Min Kim’s fourth piece as part of his February residency at FanGraphs. (He gets a couple extra days because of the month’s brevity.) Sung Min is a staff writer for River Avenue Blues, the biggest independent New York Yankees blog on the web, and has freelanced for various publications including Deadspin, Sporting News, VICE Sports, the Washington Post, and more. He can also be found on Twitter. He’ll be contributing regularly here this month. Read the work of all our residents here. Knuckleballers are rare. Lefty knuckleballers, even more so. Consider: Wikipedia’s list of knuckleball pitchers features 29 names. Only four of them are left-handers. Knuckleballers are even more rare in the Korea Baseball Organization (KBO). In the 36-year history of the league, there’s only been one ever. This one happens to be a lefty, though. Some MLB fans will recognize the name: LHP Ryan Feierabend. Selected in the third round by the Mariners out of an Ohio high school back in 2003, Feierabend made it to the majors as a 20-year-old in 2006 but had only 25 major-league appearances with Seattle in three seasons. From 2010 to 2013, he was a journeyman, making the rounds through the Mariners, Phillies, Reds, and Rangers systems, as well as the Atlantic League. In 2014, Feierabend resurfaced back in MLB for six appearances with Texas, but after that season, he signed a deal with Nexen Heroes of the KBO. Feierabend told me that the Nexen Heroes showed interest in him about a year before the signing. “The time was summer 2013. I was in Triple-A Round Rock and was having a pretty good season,” Feierabend recalled. (He produced a 6-5 record and 3.66 ERA in 120.1 IP.) “As the season went on, more and more teams from Korea became intrigued with me. About four different scouts gave me their business cards, but only one of them — from Nexen Heroes — stayed in touch.” Later, in November 2015, the Heroes finally made an offer and told him that he had 72 hours to make a decision. “Well, here I am four years later, so I definitely signed,” Feierabend said. This is Sung Min Kim’s third piece as part of his February residency at FanGraphs. (He gets a couple extra days because of the month’s brevity.) Sung Min is a staff writer for River Avenue Blues, the biggest independent New York Yankees blog on the web, and has freelanced for various publications including Deadspin, Sporting News, VICE Sports, the Washington Post, and more. He can also be found on Twitter. He’ll be contributing regularly here this month. Read the work of all our residents here. Pace of play has, without a doubt, become a hot-potato subject in MLB and for commissioner Rob Manfred. The league, of course, recently made some rule changes in order to quicken game flow, alterations that mostly concern things like mound visits, commercial breaks, instant replay, and the timing of pitching changes. We even had a league executive make some, uh, interesting propositions about the ninth inning. While many of MLB’s proposals this offseason have focused on improving pace of play, other possible rule changes have sought to more explicitly shorten games. One such idea is to increase the size of the strike zone. The idea here is straightforward: more strikes means quicker at-bats, and quicker at-bats means quicker games. With the new pace-of-play measures already announced, we won’t be seeing a bigger strike zone yet. However, another league already put that measure in practice in 2017. Last year, before the season’s start, the KBO (Korean Baseball Organization) announced that they were going to adopt a wider strike zone. The KBO made the decision for different reasons than MLB would. First, it seemed like a knee-jerk reaction to Team Korea’s poor showing in the 2017 World Baseball Classic. South Korea, the host of Group A in the first round of the tournament, was eliminated after the first two games, losing to Israel and the Kingdom of Netherlands (though they did beat Taiwan in their third and final contest). That early exit served as a wake-up call, inspiring league officials to think critically about the game. But there was another reason for the change. KBO has been a high-offense environment for the past few seasons. From 2014 to 2016, the league enjoyed an average OPS of .807, .787, and .801 respectively. It was not always this way, though. As recently as 2012, KBO skewed more pitcher-friendly, believe it or not. That season, the league had a .698 OPS. Since then, hitter OPS has increased by about 100 points in just seasons, which is significant. I could write a whole article on why that is. But for now, we’ll stick to the strike zone. After the offensive environment of the last few years, officials felt that the balance needed to shift back towards pitching after three consecutive years of inflated run-scoring. By increasing the strike-zone width and calling more strikes, pitchers would gain some advantage. When announcing the change, the head KBO umpire official Kim Poong-Gi explained that the league would not explicitly re-define the strike zone. Rather, the intent was to maximize the size within the regulated measure. That meant, hypothetically, the pitch that touches any portion of zone boundary would be considered a strike. And the new zone did inspire change. Two pitches don’t conclusively prove the point, but as examples, here is Kim Gyeong-Un of the Hanwha Eagles, taking a pitch for a ball on May 18, 2016. And here is Min Byung-Hun of the Doosan Bears taking a called strike three on a pitch in a very similar location on August 31, 2017. The new mandate not only affected ball and strike calls but also average game length. In 2016, the average KBO game lasted 3 hours and 23 minutes. In 2017? Just 3 hours and 17 minutes. It is perhaps noteworthy, as well, that for the first month of the season, the average game length was 3 hours and 12 minutes, a whole 11 minutes shaved off the previous mark. That seems even more significant! So, hypothetically, the strike-zone change could be a practical short-term solution to quicken games. The five-minute jump between April and everything after that seems significant enough to demand an explanation. Two theories are often invoked. The first is that hitters got acclimated to the change, decided to adapt a more aggressive approach, and produced. The second is that the umpires gradually went back to the previous strike zone. The first theory is going to take some numbers to support. The wider strike zone bumped up the strikeout rate and reduced the walk rate throughout the league. As you see below, there were definitely more called strikes. As a result, hitters became a bit more aggressive. The new strike-zone measure, while initially helping with the pace of play, did little to address the run-scoring environment. You could argue that the new strike zone encouraged hitters to be more aggressive and resulted in more balls put in play. The league 2017 BABIP of .327 is not much of a change from .326 and .331 from the previous two seasons. As the slugging percentage would indicate, the power did not die down either. In fact, the home-run total increased from 1,483 to 1,547. All in all, after a blip in the first month, the hitters simply continued to rake, and the game length regressed back to the norm. The second point however, is partially confirmed. As the new rule was implemented, it became clear that pitches that did not touch the strike zone boundaries were often called strikes. In a mid-July interview, Kim Poong-Gi admitted that they “tweaked” the strike zone to make it smaller than it was in April. “Because the strike zone was overly wide in April, we adjusted it a bit smaller,” Kim said, “but we are still enforcing the wider strike zone width.” If that is true, then the numbers may back up the correlation. In April, the league ERA was at 4.46. It increased to 4.63 in May and saw a dramatic rise in June to 5.64. That brought attention to a new problem: consistency. It can be hard enough to enforce a new measure. It gets harder when every umpire has a different zone. The wide-strike-zone experiment, for now, is still an experiment in the KBO. Kim Poong-Gi announced in December that the league will continue to use wider strike zone in 2018. It’s very doubtful that it will solve the run-scoring issue in 2018 with the current pool of hitting and pitching talent in the KBO. Regarding pace of play, it would be easier to conclude something meaningful if there wasn’t such a disparity between the first month of game and the rest of the season’s. Other factors might account for some of the change in game length. Given the fluctuating game length trend and the overall inconsistencies, one could say that the strike-zone change created more problems that it solved. Does that mean that MLB should ditch the idea completely? Not necessarily. If the umpires can enforce a consistently sized zone throughout the season and give the players a good idea what to expect, then it could be executed decently. Of course, another thing to note is that, throughout the baseball history, the strike-zone rules have changed multiple times. The regulation was not passed on a stone tablet like the Ten Commandments. It has been a product of adjustments according to the environment. For instance, in 1968, The Year of the Pitcher, MLB experienced an all-time pitcher-friendly season during which hitters slashed a mere .237/.299/.340 overall, with pitchers thriving to the tune of a 2.98 ERA. In 1969, the league responded by reducing the strike-zone size. In 1987, the league saw a then-record 4,458 home runs in a season. MLB adjusted the strike zone before the 1988 season by increasing the size. So it goes. The odds are that we will see another strike-zone change in future. Whether it will be for the pace of play remains to be seen. All stats from Statiz unless otherwise specified.